A Union politician and soldier. A member of the famous Blair family that had a role in national politics from Andrew Jackson through the Civil War. Blair threw his support to Lincoln in the 1860 presidential race. He rallied support for the candidate in Missouri, especially among the German community in St. Louis. 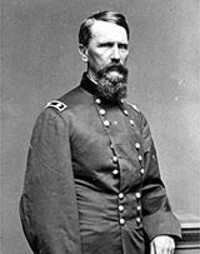 He enlisted as a colonel at the onset of hostilities, and in November of 1862 received his promotion to Major General. Blair commanded a brigade in the Vicksburg campaign, and managed a corps during Sherman’s advance to Atlanta. Blair spent his personal fortune on activities to keep Missouri in the Union during the crucial early days of the conflict. He ended the war financially ruined and assumed a number of appointed state positions in the postwar years.